Spa products are typically pricey-but in reality you can make your own! One of my favorites are soap savers. They actually save you money by making the most of soap bars, make sure your soap doesn’t jump out of your hands, and also give you extra exfoliation. The great news is, they are easy to make! Rachel has already shared some fantastic patterns: 5 Simple Soap Savers and Absolutely Easy Soap Saver. These patterns use medium weight yarn; and so I decided to try my hand on a thread version. Do not finish off, continue with body. Ch 81, sl st in second ch from hook and in each ch across. Finish off. Weave strap in and out of the ch-1 sps in round 13, and tie the ends securely into a knot. Put your favorite soap inside and tighten strap. Enjoy your new bath accessory! Or share them with friends and family. If you need anything, just leave a comment below and I’ll get back to you when I can. Happy crocheting! 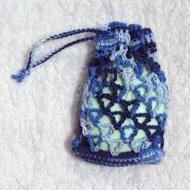 This entry was posted on Thursday, August 25th, 2011 at 9:07 AM by Claire Ortega-Reyes	and is filed under Free Crochet Patterns. You can follow any responses to this entry through the RSS 2.0 feed. You can leave a response, or trackback from your own site. Pretty! I can’t wait to make it! Thanks Claire! Really important: When making soap savers, don’t use cotton — way too absorbent. At least Peaches and Creme is. It will change your soap saver into a soap eater. Now I use 1 strand of cotton (for absorbency) and 1 strand of acrylic. Works great. How could I make this bigger or smaller? What is it a multiple of? Hello Sarah Dee! The total stitches of the base should always be a multiple of 5. Happy crocheting! I was wondering if we could have another photo round of crochet? Maybe with any any stuff less than 12inches…..like a soap saver , neclace, braclet, milk pot handle, baby bottle cover …. Just anything one can think of .It would be creative fun!! !